Hi Kylie....had to swing by and say Hi, as it was seeing it on your blog, that I joined in with OWOH. Don't forget to enter to win my door prize hun. Hope you get lots and lots of visitors in OWOH. Oh wow...does that mean it is a whole year that I have known you. Life goes fast. This a beautiful bear. I hope too that you get lots of visitors to see your wonderful creations. I think you entered my OWOH last year and I've since gone to know you better. This bear is so adorable. We should call her Beary Jane if I win or Beary Ky.
G'Day from Brisbane! I'm so glad you stopped by my OWOH giveaway. Now, here I am to say, "Hello!" And enter your giveaway, too. Your bear is too sweet. It can have a home with me. What a beautiful giveaway ! its soooo lovely!!! I won from you last year--a wonderful assortment of papers and a Handmade magazine (I still have it!). Wow... you're so creative! This bear is the cutest one i've ever seen!!! Sooooo unique and sweet! Someone, somewhere is going to be very happy with this beautiful give-away... I can only dream it's me!! I'm enjoying this OWOH trip around the world, thanks!! Just adorable! Lately I've been making some stuff for little kids so I'm totally into toys these days and I just love this bear! Please stop by my blog also! Kisses from Croatia! TOO STINKIN' CUTE! !In love with your blog...wonderful giveaway! Oh, this bear is just too precious! You did such a nice job! She looks like an "Anabelle" to me! G'Day to you!!! Blue is one of my fav colours! Hey! It's always great to meet another Aussie blogger! Please add me to you draw!Love your work!My grand daughter would love this bear! What a sweet, sweet bear. I would love to win her? Please add me to your giveaway drawing. Thanks for visiting my blog during OWOH and following. I so appreciate it. Whata sweet little bear!! Thank you for being apart of the OWOH journey! Oh, my grandbaby to be would love this! Thank you for taking the time to offer this lovely gift and thank you for the opportunity to win! Hi Kylie, your little bear is the cutest!! I'd love to find a good home for him here with me!! I've become a follower as I see you make lots of fabric items and that is my latest craft love! Thanks for already stopping by and entering my giveaway. She's adorable!! I was thinking along the "Blue" line, too. How about Azul? (Blue in Spanish). Whatever you pick will be perfect, I'm sure. You've done a wonderful job. Oh, count me in on the giveaway. You know how to find me! Hope you have oodles of fun during OWOH. What a darling blog. Everything you make is so wonderful, and the lil bear is adorable. Thanks for your generosity and participation in the event. Count me in please. I just know my new grandson would love this little bear. It is adorable. Please add my name to the drawing. Thanks for he giveaway, it's such a cute bear! Personally, I would call her Thena! what a lovely bear!! !...It is just too cute!! Your little bear is just so cute. This is the cutest bear. Please include me in your drawing as I would love to have it come home and live with me. What a great give away, what a cute bear, I hope you'll stop by mine. From one Kyles to another. I love your gorgeous bear. Please count me in. My goodness! How adorable! What a great giveaway! Oh. My. Gosh. That is just the cutest thing ever! I can't think of a name for her. I think I would have to ask my kids. LOL But she is adorable! Hi Kylie, thank you for stopping by. What a lovely bear. My african daughter would love her! Hi Kylie... Thank you for visiting my OWOH post and for the lovely comment on my collage. Cute bear you have made for your 'door prize', who could resist it. Hi Kylie, thanks for visiting me, i love your creations, esp the fruit, they look fab! Great to meet you! Your bear is totally adorable! I hope I win and thanks for the chance! This is the cutest bear indeed. I love its color. Oh my goodness, that bear is sooooo cute! She does need a great name and I'm drawing a total blank! lol She's so sweet! Hi from the U.S. You made that darling bear! yes, I would love to have it come live in my home. it is nice to meet you. That is just the sweetest thing I've seen today except my little Scottie Arwen giving me my morning kiss. ohhh how sweet is this :) It looks soooo cute. Please add my name. Wow! So cute...I’d love to be a lucky winner! Hi Kylie, so lovely to meet you! Please add my name for your giveaway, I would so love to win your gorgeous little bear:-) I think I would name her "Missy"! A very cute bear, thanks for the chance to win in your OWOH giveaway. So sweet! 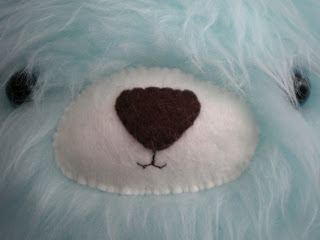 I love the fur although I hate sewing it! Stop by and visit my OWOH! I'm #50! Great blog!Hello from icy Ohio! I am glad to meet you here! I love your bear...I bet mt granddaughter would love it too! wow, lovely bear.I will call her:"Candy"
Candy is sweet.Dulce es dulce. Ciao! I am so happy to meet you today on the wings of OWOH! Thanks for a chance to win your wonderful giveaway - your bear is adorable!! Hi Kylie, of course your an Aussie :) like our greatest export (or is she English now? LOL) By the way I'm pleased to meet you - I'm Shelle from Sunshine Coast Australia :) If you have time I'd love you to come on over check out my giveaways & comment at my OWOH post too :) One World One Heart... It's a marathon BUT SO MUCH FUN!!!! absolutely AAAdorable! he's so cute, would love to win. please visit Thistle Cove Farm when you've time. Hi Kylie, love your bear, she is very cute. Guess what - I live in Murray Bridge too - small world isn't it! sweet blog & such a cute little bear offering! just darling!! She is adorable! Her face is just the sweetest! I would name her Bleuette! Your teddy bear is delightful - she would love living in my studio, overseeing my projects. Kylie, if I were lucky enough to win that little bear, much as I like him, I would have you send him to one of the Aussie charities collecting for the children affected by the floods - or the cyclone!! 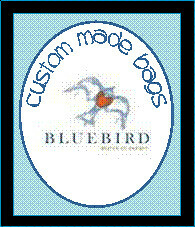 Less postage for you and much needed love for them! Your bear is adorable! I collected bears in the 70's & 80's. I have an extra bedroom where I display them. Yours would be a special addition. I would happily give her a good home!! I would love to win your adorable bear, especially since I'm expecting a new baby soon! Please enter me in your giveaway, and stop by my blog to enter mine! Hi Kylie,your bear is beautiful! How difficult it must be to sew that furry fabric. So cute!! She is so cute! I have been siting here for what seems like ages trying to come up with a name suggestion. I saw an old Brady Bunch the other day. What about Cindy. well... I met you in the past OWOH and for that I'm so glad!! Lately I haven't post as much as I wanted but I'm always grateful when you leave me comments. What else can I say? I love your work!! Hello from Florence, Oregon USA. You have a great blog and I love your giveaway. Your bear is darling. I have been following your blog for quite awhile and enjoy your creativity. Thanks for sharing your ideas. This is definitely one of the cutest bears I've ever seen. I'm somewhat of a bear collector too. What an adorable bear!!!! I would love to win this sweet little blue girl! Hello from Oregon. Thanks for the chance to win your giveaway. Too stinkin cute! Hi Kylie. Thank you for welcoming me to your Blog. What a wonderful bear! You truly are an inspiration to us relatively new crafters. Please feel free to enter my drawing also. Just click on my blog link, or I'm #625. 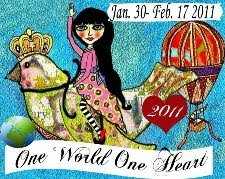 Visiting from One World One Heart 2011! Thanks for dropping by. I love your little bear. I would give it a great home. I hope you are far away from the floods and hurricane. I'm # 11, and would love to have you stop by if you haven't already. lovely door prize! lovely meeting you too! i am so glad to have joined OWOH and meet lovely bloggers like you! Hello from Wyoming! My, what a lovely little bear...perfect for a special child! I love it. Isn't this event fun? Your blog is awesome and there are so many fun things to see. I will be back to browse some more when the event is over! Please enter me in your drawing. Your bear is so adorable! Isn't OWOH a beautiful way to discover other great blogs? I hope you'll visit my blog too, (Art of Humungous Proportions) when you get a chance. I love your bear, so soft and cute... stop by my blog as well! Hi Kylie and greetings from another Aussie. Your little blue bear is so beautiful and such a generous gift, I have just the little girl in mind if I am lucky enough to win. Please come by my blog #9 and say hello. Please add my name to your fantastic giveaway, and thanks for the opportunity to win. 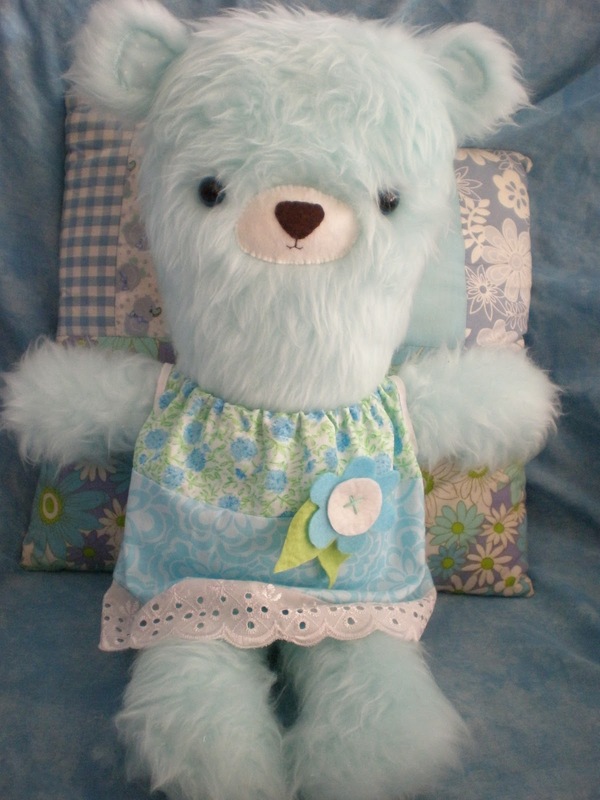 I would so love to take your beautiful blue bear home. I want to mush her!! Too cute! Hello from snowy and cold Massachusetts. Your bear would fit in perfectly! Just adorable. What an adorable bear! I've enjoyed your blog, your tribute to your son was beautiful, I so love the picture with the halo! Thanks so much for the chance to win your sweet bear! This bear is adorable! I'd love to win him :) Please enter my name into your draw! And pop over to my blog and enter mine, too, if you haven't done so already! Such a sweet bear! I love softies of all kinds! oh my goodness..how adorable! I''d love to have "Bella Blue" come live with me and to have a special place in my living room at the little bright red bistro icecream table I have displayed in my living room. my little girl would love pretending to have tea with her.so pretty and creative. so nice to meet you through this event. please stop by for a visit on my blog too of you'd like. OMG!!! Adorable!! Lovely! Super sweet! Please count me in! Your bear is SO CUTE! Please enter me into your draw -- thank you so much! oh my gosh your bear is so cute!!! What a great furry bear you have created as your giveaway prize. It is really a fun bear and is going to be well loved by its winner. Enjoy your OWOH journey- there are lots of wonderful blogs out there to visit. Hello and so glad to meet you. Happy OWOH. Would love to be part of your wonderful giveaway. I have a little one that would love that bear...oh who am I kidding. I would love it too Please stop by during your journey through blogland. what a cute bear! Please enter me in your giveaway and come enter mine! OMG! So cute! I want one. so nice to meet you Kylie! your little bear is adorable! i would love a chance to adopt her! OH for CUTE! If I win, that will be going to my little godchild that we get to meet in late summer! please include me! Hello, it's nice to meet you! I love Australia and that's the cutest bear! This bear totally reminds me of my childhood for some reason but I can't put my finger on why. She's so adorable in her little retro dress. What a sweet bear!! I would love to win . Please include me in your drawing! I wish I could make such an adorable doll but my sewing skill is limited. you are so talented. I am #771 if you like to visit me. hope your day is sweet! ps, if you like to add numbers to your comments, email me. drawing! Please stop by and enter my giveaway too! P.S. I'm your newest follower...hope you'll join me too! Hi Kylie - greetings from Sydney!! I think I'd call her Nila, which means blue in Sanskrit. Can you please enter me in the drawing for your great giveaway? Thank you so much!! Ooooh gorgeous bear, Kylie. Thank you for the chance to win! I think I qualify I have a blog in fact I have 2 and even though my husband thinks I'm from another planet I do live on this one for the time being;). I love your little bear his to cute. It's been great visiting. Oh how adorable! Please enter my name into your drawing. Hi Kylie, greetings from Southern California. I am so glad to stop by here on this OWOH flight. Thank you for your wonderful blog and your sweet little bear. If you get a chance on your journey come by my place and spend a moment of you precious time with me. Adorable gift! Please enter me into the OWOH give away. I'm #509. I'd love to have you visit my blog and have a look around, too. I'm offering a shabby chic denim necklace from my ReStyle Studios. I enjoyed your blog. I am a bear collector, so your sweet little bear would be in very good company at my house! You are so right -- this little bear is VERY cute! :) Thanks for the chance to give this cutie a good new home. Hi Kylie, greetings to you from a neighbour (4-5 hours into Vic, near the Grampians)An awesome creation for the doorprize, I would love to win, please count me in! 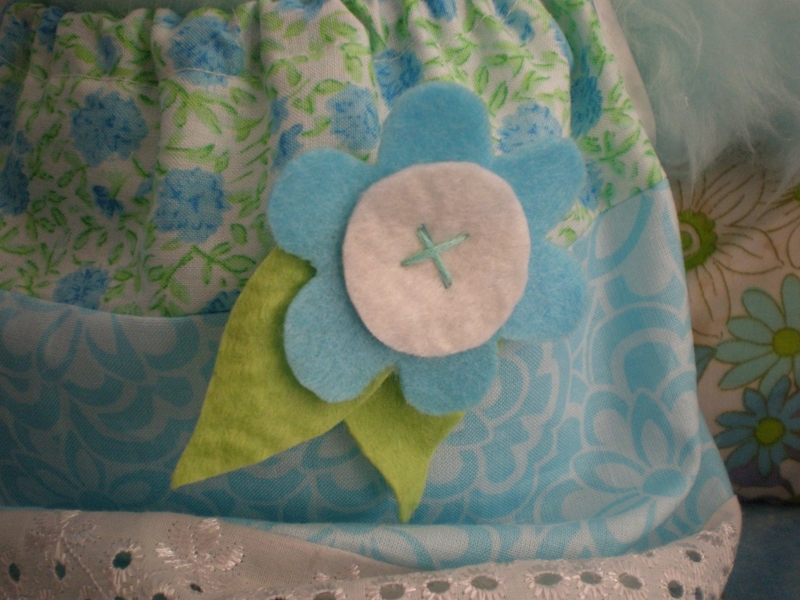 I now follow your blog, and will enjoy visiting to see all your crafty exploits. I hope you will visit me, I am OWOH 248! I love your adorable bear - she's such a cool shape! The bear is adorable and I would love to give it a good home. Hi Kylie, I'm happy your travels brought you to Pennsylvania and my blog. I agree, your little bear is the cutest darn bear I think I've ever seen! She's so unique :) Enjoy the rest of your travels. Hi Kylie, I would love to win your cute little bear. Count me in. He's socute! Please visit my blog, too. I am the author of "16 x MOM: A Mastery of Motherhood." I am giving away my book and a couple of laminated 4 leaf clovers. Hi Kylie! Hello from Chilliwack, BC, Canada! 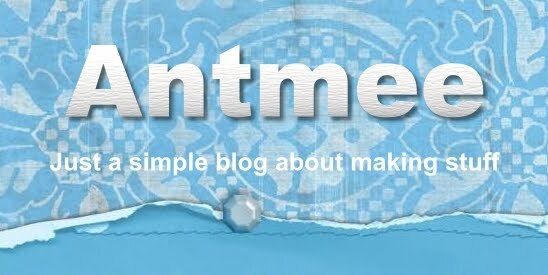 Thanks for dropping by my blogs during the OWOH 2011 hop! Hope you’ve had a fabulous experience! It’s a pleasure meeting you and I take my hat off to you as I'm not one for sewing. Needles aren't my thing! lol Keep your art alive! Beautiful bear! Thanks for a chance to win it!